If you’re a keen gardener, or have recently had your garden beautifully and professionally landscaped, you’ll no doubt be feeling a little nervous about how your most valuable plants will fare in the frosty weather. If your garden is particularly susceptible to frost, then one of the best things you can do is plan for frost during the garden design stage of your landscaping project. 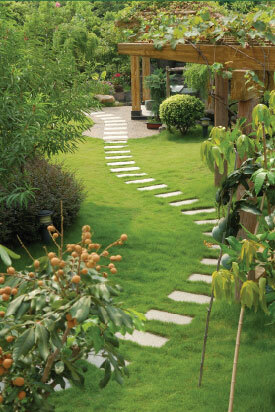 For example, areas of the garden with walls or hedges close by are afforded a greater level of protection. Therefore, more delicate plants should be planted in these areas. Similarly, the lowest parts of your garden will form frost first, so if you have any hollows or slopes in your garden, hardier plants should be planted here. And the most delicate plants should not be planted in east-facing areas, as the sunlight will mean that they defrost too quickly and cause further damage. It’s also a good idea to use pots and containers for very delicate plants, so that these can be brought inside during particularly cold weather. The likes of evergreens and perennials can benefit from a layer of mulch during the winter months. This will act as a blanket layer to protect their root systems. Apply a layer approximately 5cm thick around their base to keep them insulated. Protecting plants with blankets can be effective in the fight against frost. Fleece-covered frames can be used to protect plants growing against walls, and fleeces can also be used to cover plants in the ground. However, don’t let the blankets weigh the branches and foliage down. Instead, prop them up with sticks to keep the blanket over the top of the plants. You can even wrap tree trunks where necessary, although chicken wire and straw works best for this rather than fleece or bubble wrap, as this will prevent rotting. If you can, investing in a greenhouse or polytunnel can be a really effective way to protect your plants from frost. These will trap heat inside, keeping the temperature a lot higher in the winter months than in your open garden. Protecting your garden from frost now will really pay off once spring and summer is here again. It’s worth taking the time to ensure that our most precious plants are warm and cosy, so that you can enjoy your garden again in the warmer months, without having to start from scratch and replace your most valuable plants.